Your holiday table will look especially festive decorated with these sweet, mostly edible, marzipan treats. Adults and children alike will be enchanted. Marzipan is usually produced from very finely ground blanched almonds, sugar and an enzyme to retard crystallization. Its ingredients are similar to almond paste, but marzipan works better for molding shapes (and in filling stollen) because it is much firmer. Marzipan is available in natural food stores and online, but always check the ingredients listed on the labels as some brands, such as Odense, contain wheat starch. 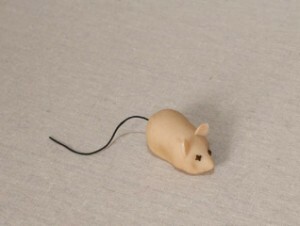 To make 3 mice, divide 6 ounces marzipan into 3 equal pieces. Roll each one into a ball, and elongate it to make a cone shape. Pinch in the sides lightly to accent larger hindquarters. Make a hole with a toothpick at the rounded end, insert a 4-inch length of thin cord (shoe lace works) and press lightly to secure in place. (Remove the tail before giving them to children or use a thin piece of fruit leather instead of a shoelace.) Insert a couple of pieces of sliced almond at the head end to make ears, and two cloves or dried currants for the eyes. Real hedgehogs roll themselves into a ball to escape predators, but that’s no defense for the delicious marzipan variety! To create one, roll 7 ounces marzipan into a ball. Elongate one end to form a pointed cone with a rounded end. Turn up the nose slightly. Starting 1 inch from the nose end, insert a semicircle of slivered almonds about ¼ inch apart, angling them towards the tail end. Continue making rows of “quills” until the whole surface is covered. Insert two cloves or dried currants to make eyes. Cut in slices to serve. To make about 10 little acorns, roll 3 or 4 ounces marzipan into ¾-inch balls. Elongate each ball into a narrow egg shape. Holding the top end, dip each one half way into melted chocolate, and then roll in dark chocolate sprinkles. Lay on foil and refrigerate until set. You will have leftover melted chocolate. Spread it out on a sheet of foil and sprinkle with a few chopped nuts and raisins and the leftover sprinkles. Refrigerate. Break in pieces to serve. These look astonishingly like the real thing. Cutting a few of the miniature potatoes in half to show off the pale interior heightens the effect. To make about 10, you will need 4 ounces marzipan. Pinch off small pieces and roll into irregular balls and ovals, ¾ to 1 inch long. Dip your fingertips in unsweetened cocoa powder and “paint” each potato with a light, irregular coating. The author of more than a dozen cookbooks, Jackie Mallorca’s latest titles include The Wheat-Free Cook: Gluten-Free Recipes for Everyone and Gluten-Free Italian. For more information and recipes, visit her website at www.GlutenFreeExpert.com.